Downhome's story carries on the fine tradition of three of the earliest gear pioneers--- Holubar , GERRY and Warmlite, all companies where a married couple had a dream and began making outdoor gear of their own design. Alice and Roy Holubar, Ann and Gerry Cunningham, Jack and Joan Stephenson --- and then 20-30 years pass, and Downhome winks into existence under the hands of Chuck and Denice Kennedy . They were a tiny custom sleeping bag company hidden away in the remote coastal mountains of Northern California. Unlike the many pioneering companies that sprouted up in the city environments of Boulder, Seattle, Los Angeles or the Bay Area, DownHome appears to have drawn its energy from a direct day to day experience of being right in a wilderness-like locality, in this they were similar to Rivendell at the base of the Teton Range. It's the only gear pioneer that my home State of Oregon can lay claim to. Downhome bags were only available by direct mail order, with the sole exception of one retail dealer in Colorado named Danny Fleming. Click here for more on this story! Downhome's ultimate fate is unknown, and I will appreciate hearing from any and all readers who have further information about Downhome and its founders Chuck and Denice Kennedy, last known address, late August, 1993: "West Fork Road, Deadwood, OR 97430," ph 503-964-3012 (nowadays, area code would be 541). Their catalog tagline is "Equipment for the Trek." Below is an ad from "Wilderness Camping" magazine, April/May 1979 (see previous paragraph: Larry E is the illustrator).... The Downhome company was in Arcata at that time, and were there until about 1980, when they moved some 100 miles north into Oregon, settling in the tiny community of Deadwood, which lies on the highway between Eugene and Florence on the Coast (and closer to Florence). They apparently went out of business sometime after August 1993, but thus far my research does not reveal exactly when. The "why" appears to be that the founder and his wife closed the business to pursue faith-based works on behalf of children (I do not know the details)..... The image below shows Chuck Kennedy himself. According to his fellow gearmaker Andy Montgomery, the two designers often had fun spending time together doing such things as perfecting the fit of the Downhome hood. 1. SLEEPING BAG HOODS-- the most prominent innovation of a Downhome bag was it's big, fat, free-floating hood (see image at page top). 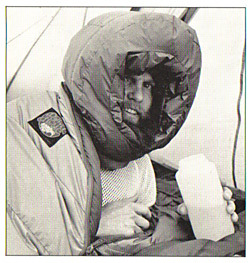 Chuck analyzed the performance of standard sleeping bags and went one BIG step in the Great Unknown. In the general history of sleeping bags, remember that it had been a great leap forward when early designers had dissected the flaws of the old-fashioned flat bags with the square tops and no hood and then created the modern form-fitting "mummy bag" shape with integral hood. 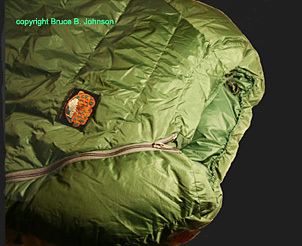 Chuck saw that there were problems with the integral hood design-- it doesn't function very efficiently when the sleeper rolls over and buries his face in the hood, breathing moisture into his bag; additionally, cinching up the bag tight enough during really cold winter conditions is problematic, and many sleepers simply feel too clastrophobic to cinch the hood small enough to truly minimize heat loss from the vulnerable head and shoulders area. Some innovative designers have tried to cope with the problem by means of a "down collar" to isolate the leaky hood area from the main portion of the bag, and that, insofar as it goes, is a good solution and works well (I have a very comfortable down collar on my Feathered Friends bag, for example)......But Chuck threw out convention entirely, and chopped off the mummy bag hood, making it a part of the sleeper, rather than a part of the bag! So the hood moves with the sleeper rather than fighting him during the night! Ingenious! And Chuck's hood is not just a parka hood from a typical jacket, it is conceptualized as a piece of equipment with the FULL insulating value of the rest of the bag, be it a winter bag or a summer bag; so his hoods are masterfully crafted with intricate baffling to have the full loft of the bag (in my image, a winter bag hood is shown)....Joke: "How can you tell if you've reached the camp of the DownHome bag owners? Answer:: look for the camp with a bunch of really big-headed people standing around the campfire!" 2. Innovation #2: Specially shaped shoulder area and zipper route (Chuck's term was "Shoulder Pocket Design")... 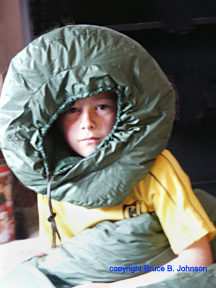 This zone of the bag was extensively re-thought, and, in conjunction with the floating hood, functioned as a unit to diminish to near zero the heat-loosing compromises at the top of the sleeping bag.... . And that shoulder area was truly a work of art, with intricate construction details and complex baffling second to none. In 1984 Chuck described his baffling system as "Trapezoid Stabilized Baffling." with a baffling spacing of a close 5 inches on summer bags and a fanatical 4 inches on winter bags. 3. Innovation #3: Double zipper system instead of standard draft flap. Warmlite bags of course were the pioneers in the double zipper system. Having a double zipper facilitated the "MSS" (Modular Sleeping System, see #6 below) in that the bag essentially had two subtypes of inner girth-- with one zipper open, the bag was roomier and cooler; with both closed, it maximized its warmth and made it snugger with less wasted space to heat; also, with one zipper open, there was room to insert the inner bag, eg. the Zephyr, to increase the loft of the bag system by 2 to 2 1/2 inches! 4. Vapor barriers optional, compare to Warmlite bags where Jack Stephenson really preferred to make only bags with integral, non-removeable vapor barriers..
5. Downhome's use of snaps on the underside of the bag to provide a Non-roll-off sleeping surface was an innovative break with convention. Downhome's concept had distinct similarities to the Moonstone "Modulus," which is discussed below. One also will wonder if the name "Modulus" on the Moonstone bag hints at a connection to designer Chuck Kennedy, especially since the two companies even shared the same building in Arcata for a long time before Downhome moved to Oregon. 6. Multiple tops, like a Warmlite bag...Chuck named his system the "MSS," for Modular Sleeping System. In the big picture of the label near top of page, the blue bag is the Zephyr, and in the other images on this page the green bag is a Dipper--- not shown is the snap-on sleeping pad made of "Evazote" (EVA) closed-cell foam in 1/4, 3/8, or 1/2 inch thickness (similar to ensolite).. In my mind, the MSS was very similar in concept to the famous Warmlite Triple Bag. (The green bag in images above and below is a Dipper) Notes: In the 1979 DownHome catalog, a Goretex-shelled Dipper sold for $356, while at the same time a Stephenson's Warmlite Triple Bag sold for $355 (which included the premium DAM (down airmattress, the only sleeping pad one would ever need). The Dipper, however, was not a total bag system; instead, it was a basic four season bag for areas with moderate winter climates. If one bought the Zephyr and a VBL, (and a snap-on pad) then you had a true all-season modular bag system for all extremes from 50 above zero to 40 below zero (but at a much greater price than a Triple Bag). The Dipper shown is a Shape 2 (the medium girth). 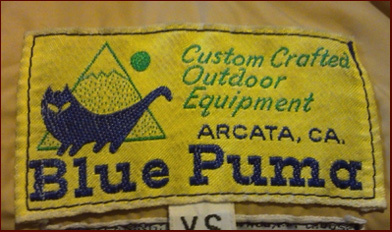 ARCATA, CALIFORNIA-- The Birthplace of both MOONSTONE MOUNTAIN EQUIPMENT and DOWNHOME. (image = "Strange Bedfellows")... These two custom gear makers both sprang up in the late 1970s in the same small, isolated Northern California town. (originally Moonstone's name was "Moonstone Mountaineering, INC.")...... Was this dual birth just a coincidence? If one studies the design features of DownHome bags, especially the DownHome Modular Sleeping System, and then opens an early Moonstone catalog, they will see products like the Moonstone Spectrum II bag with a removeable hood, or the Modulus with a removeable hood, built-in sleeping pad and no down at all on the bottom (Modulus is the blue Moonstone bag in image)... It's a fact that Chuck Kennedy was designing innovative gear with and around other Arcata buddies for years before the official births of Moonstone Mountain Equipment and Downhome. 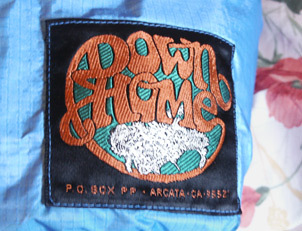 Chuck's "Downhome" focused mostly on his own line of very advanced down sleeping bags and was begun in Arcata about 1978 or 1979. A few years later (about 1980) Mr. Kennedy and his wife Denice moved DownHome across the border into Oregon (My research thus far reveals that Moonstone began in about 1977, a year or two before DownHome)... Home for the Kennedys became a tiny place in Oregon's Coast Range outside Eugene called Deadwood. Some correspondents tell me that the company was still making its custom bags in the August 1993, but after that the one firm piece of information that I have received is that as of about year 2000, Chuck was heavily involved in Catholic charities and not at all involved in making his wonderful custom bags any longer! Jacks R Better. A small, modern company that carries forward the revolutionary concept that your puffy insulation ought to placed in the sleeping bag's top, with nothing beneath you except an attached pad to provide ground insulation. Jacks R Better 800 fillpower down "quilts" are popular with the ultralight backpacking crowd. I am heartened to see the earlier pioneering work of Warmlite, Moonstone and Downhome carried forward in this way. Much longer-lived than DownHome has been the business course of the small custom gearmaker Stephenson's Warmlite, which has never changed its name or ownership in some 50 years of doing business since 1958. 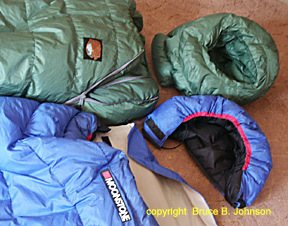 In relation to sleeping bag design, Warmlite pioneered the concept of modular bag "systems," and also pioneered the use of the double zipper draft flap, and the concept of bags with no down on the bottom and built-in pads which the sleeper cannot roll off of-- all more than ten years before DownHome bags. Last Note: DownHome also manufactured a one person Goretex shelter called the "Misty Mountain Shelter." Please Note: All Material above, and in all my "History of Gear" webpages, is copyrighted, and no usage of my material is permitted unless explicit permission is granted by me, Bruce B. Johnson, owner of OregonPhotos.com. .. Editors: Please contact me if you have interest in publishing....Others: if you were involved with one of the old-line, vintage gear companies and have a story to tell in these pages, please contact me soon (oldgear@oregonphotos.com). Main Page: Essays and pictures about the Pioneers of the Outdoor Gear Revolution, 1935-The Present, 45+ pages, five books completed, and still growing! Danny Fleming, the founder of a chain of five mountain stores in Colorado, wrote to me in April of 2013, saying that he was the sole retail dealer in the U.S. for Downhome, beginning in 1979 when he opened his first store. The stores, named "Mountain Miser," were located in Denver, Boulder, Fort Collins and Grand Junction (GJ is where Marmot was founded and lived during the 70s). Eventually Mr. Fleming closed his stores when REI and EMS moved into the areas and out-competed him.